“Brumme” is a big organ pipe with an internal length of about 5 meters. It makes tones in the range between 15hz up to 40hz and is driven by a big industrial fan. 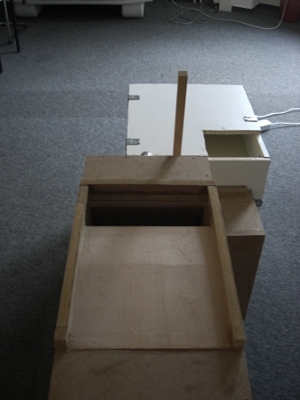 The intention was to build a sounddevice which touches the infrasonic range of 15hz and is unhearable for many humans. “Brumme” also creates the possibility to analyze how such a deep subbass behaves in the architectual conditions of the the exhibition space. The pipe has a little slider to regulate the airstream and the resulting toneheight. 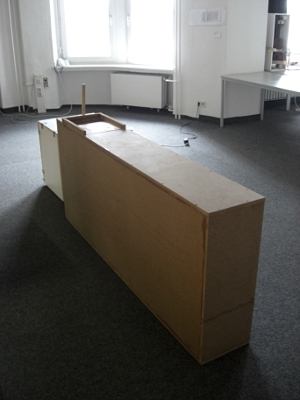 It was shown at the annual exhibition of the “Academy of Media Arts Cologne” in 2010.